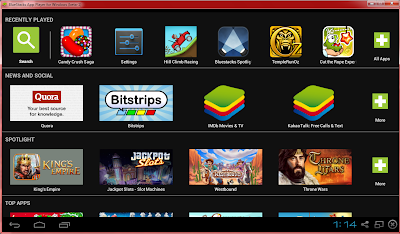 Hello guys today I am going to show you the simple trick to solve this annoying problem of Bluestacks black screen which majority people are suffering from and not getting the solution. 1. Stucks at loading screen. STEP 1 : Download and install a fresh and updated copy of bluestack from its official website. STEP 2 : Manually search for the Update of your graphic card to latest version. STEP 3 : That's it . You are done . Now bluestacks works fine. ENJOY. 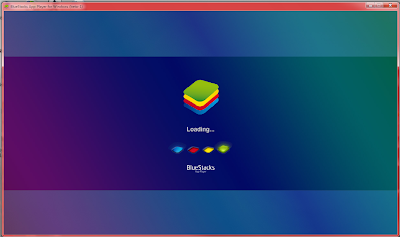 Update my graphic card to latest version .... and reinstall bluestack ..
try to install Bluestacks HD appplayer pro. (Somewhat older version approx 103MB) and download its offline installer. The newest version might not supporting your configuration. and this bluestacks or what still showing blackscreen and sometimes stop responding. I have a mac. Do you know where I can get this version of Bluestacks your talking about? I found the solution to my black screen problem in BlueStacks, from the forum at BlueStacks support. BlueStacks is aware of an incompatibility problem with the latest v334.89 of the NVIDIA GeForce graphics driver. I had recently upgraded my graphics driver from v332.21 to the latest v334.89. My updated BlueStacks didn't like it. Apparently, the new driver was too new for the updated BlueStacks. So I rolled the driver back to v332.21, and BlueStacks is working fine again...no more black screen! Now that BlueStacks knows about this problem, hopefully the next version will keep current with graphic driver updates. So if the same black screen problem happens later with BlueStacks updates, rolling back your graphics driver should solve it. Whether you are running NVIDIA drivers or another graphics driver....if you recently updated your driver, try rolling it back to the last version that worked with BlueStacks. There is a BlueStacks "Black screen" Problem with NVIDIA v334.89 graphics driver update. BlueStacks is aware of it because they just posted it in their support forum. A large blank white square may appear in the upper right hand corner of the BlueStacks App Player window when running an app, and then you get a black screen. Audio still works, but no video. 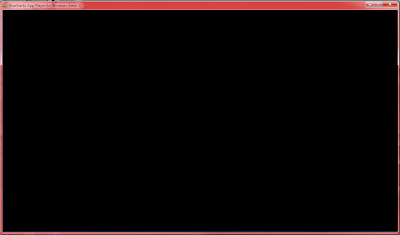 This problem occurs with the new NVIDIA GeForce v334.89 Driver released February 19th, 2014. Currently, the problem can be fixed by downgrading your video/graphic drivers back to the previous version. My solution...rolled back to driver v332.21, no more black screen. If you're using a graphics driver other than NVIDIA and having the same problem, try rolling it back to the last version that worked properly with BlueStacks...that should fix it. So if you've recently upgraded your graphics driver, NVIDIA or not, and you're getting this problem, roll back your driver to the last version that worked properly with BlueStacks. I have a Dell D620 on win7. The simple solution for me was to click on properties for the launcher and Choose Compatibility Mode Tab, Select Windows 7 and Select Disable Desktop composition. 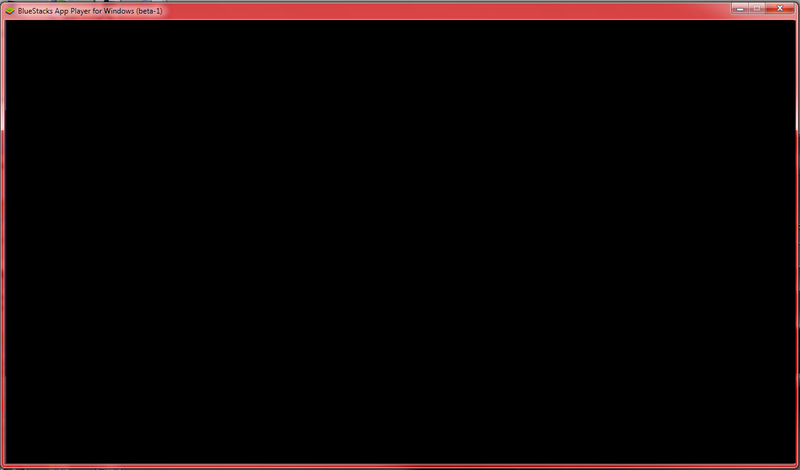 By Trial and error this worked as I seem to have good NVidia drivers and no issue with other applications. where is Properties?! I could not find that to choose compatibility Mode!!!! if i uninstall bluestrack my data and whats pics will be removed? Yes. It will ask you keep backup of your apps and data. This might save your Pics. Instead just follow above procedure and move then on your pc harddisk. They released a new version today. It's a lot cleaner than the old one. Thanks for keeping the readers Updated..
what of the stucking at the loading page can l get help as well?? i have a problem with mine is says android updating optimising applications every 2 minutes i can not go on any apps please help? I have Windows 8 on an HP, I have updated my Graphic card and reinstalled Bluestacks but its still stuck at the loading screen. My Graphic Card is AMD Radeon HD 7340 Graphics. Do I install a later version of my Graphic Card or install a later version of Bluestacks??? **If you encountering problems with Blackscreen, or stuck at loading.. choose setup Low Spec. Install a settings app and turn off sleep timer. I set mine to never sleep and it works fine.